South Korean electronics giant, Samsung has been able to sell more units of its popular Android powered Galaxy S4 when compared to the Apple iPhone 5 in the US market, according to a new report. Indian government has disconnected telephone numbers of nearly 51,000 telemarketers who had not registered themselves with the department but were carrying on with their marketing activities. This is a good step. Ever since the Do not disturb registry was launched in India, the telemarketing companies were directed to follow the guidelines and to register themselves. The United Arab Emirates has shown a robust performance on the non-oil trade front as it rose 14 per cent to Dh754.4 billion in 2010 compared to Dh660.4 billion in 2009. Recently released figures by the Federal Customs Authority (FCA) said that import grew 8 per cent to Dh485.4 billion in 2010 as compared to Dh447.4 billion in 2009. UAE’s export stood at Dh83.1 billion in 2010, reporting an increase of 27 per cent during the period. Re-export too posted encouraging numbers by surging 26 per cent to from Dh147.7 billion in 2009 to Dh185.9 billion in 2010. The non-oil trade growth has shown robust numbers despite challenging period faced by international trade in addition to ripples of global downturn. The global PC shipments have increased by 27% in the first quarter of 2010. For the first three months of the year, the shipment of personal computer is found out to be84.3 million units. This was reported by the IT research and advisory firm Gartner Inc.
As per the preliminary reports of the research this fact has been found out. This result has been much beyond the result that had been expected earlier. Gartner Inc. was expecting a 22% growth in the shipments. Principal analyst at Gartner, Mikako Kitagawa has informed that the stronger-than-expected growth was due to the vigorous recovery in the European economy. GM India's Successful Bounce Back! record growth of 126% in sales for the month of February 2010. 4,921 vehicles sold during February 2009. The UK economy grew by 0.3% in the last quarter of 2009 that was faster as compared to the 0.1% growth forecasted. The initial estimate released during the last month claimed that the UK economy had grown by 0.1% in the last quarter of 2009, indicating the fact that it had emerged from recession. As the economy is now believed to be at lower level after the recession, the growth rate has been revised up. The significant contribution by India and China in "revival of global economy" was highlighted by The International Monetary Fund. This statement came as answer to a question asked to an IMF official. 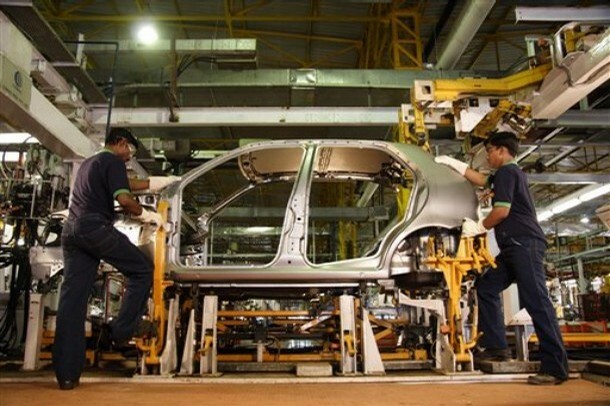 The auto sector in the country recorded a growth in sales as demand in the domestic sector and exports rose in the month. Auto makers, Maruti Suzuki, Hyundai Motors, Tata Motors, Mahindra & Mahindra, General Motors and Fiat recorded higher sales in the month. Maruti Suzuki India Ltd sold 95,649 vehicles during the month against 71,779 in January 2009. This included 14,562 units of exports for the company. Exports of the country grew for two months in a row and registered a growth of 9.3 per cent in December. The total export grew 18.2 per cent in November after recording fall in 13 straight months before that. Exporters appealed to the government to continue with its stimulus package as the revival in economy pushed up demand and raised exports. The higher growth recorded was believed to be mainly because of the lower base effect of December 2008. A 33.3 hike in sales in January at 95,649 vehicles was forwarded Monday by India's largest car manufacturer Maruti Suzuki, compared to the same month last year. The company specified in a regulatory filing that it exported 14,562 units during the month under review. The sales increased 31.8 per cent to 826,592 units for April-January, compared to the same period in the last fiscal. The United States Department of Energy, in its efforts to expedite energy saving measures in corporations, has announced a $115 million grant for companies including Yahoo! Inc., Hewlett-Packard Company and I. B. M. T. J. Watson Research Center. The total funding of more than $115 million for energy efficiency would be funded by the department and private industry for $47 million and $70 million respectively. Energy secretary- Steven Chu said, "The expected growth of these industries means that new technologies adopted today will yield benefits for many years to come." Agitated passengers did not have the most cheerful Holiday period after they were stranded aboard various different flights, when the weather got unusually icy. But now, the Obama Administration has stepped in to make sure that nothing like this ever happen again, after the Congress failed to do take any appropriate actions despite repeated requests. Himachal Pradesh government has started a mass campaign for a week in the state with a view to make the State free from plastic. In the campaign 'Polythene Hatao Paryavaran Bachao Abhiyan', whose beginning was marked by the Chief Minister, Mr. Prem Kumar Dhumal, around 15 quintal of the plastic waste was collected in the timeframe of few hours. The collected polythene garbage was loaded in the truck and was flagged off by the Chief Minister to be used in the construction of the poly-green road. This experiment has already registered success in some parts of Himachal Pradesh. Government is committed to enhance spending on road infrastructure and proposing to bid 8,000 km of road construction contracts for the current financial year, stated the Planning Commission Deputy Chairman Montek Singh Ahluwalia. Speaking in the sidelines of a national conference on leadership organized by CII, Dr. Ahluwalia said, "In comparison, the government bid out 2,000 km of road construction contracts during the last three years." Infosys Technologies, India's second largest information technology services company, has planned to hire 13,000 freshers, from the college campuses for 2010-11 period. Though the number of engineering colleges it visits every year for campus recruitment is expected to decrease by 50% as compared with the year 2007. The Senior VP and Group Head for HR, Nandita Gurjar has informed that the company is going for the campus placements as the conversion rate, which is the number of people who get offers and finally join the company, in the last two years has improved dramatically. Retail spending in New Zealand remained moderate in November, reporting an increase of 1.2 per cent during the month as claimed by Paymark, having a large number of electronic transaction retailers in the country. The report said that the recent moderate surge seems to be indicating the history of previous year when sales surged just before Christmas. Total number of transactions increased to 71.4 million during the period, he claimed. The manufacturing sector continued its upward journey for the fourth month in a row in November but still there are waves of uncertainties in the market on accounts of patchy recovery. The Australian Performance of Manufacturing Index (PMI) was reported at 51.2 points due to less than expected growth of orders and decline in inventories. The production sub-index stood at 54.0 in November and employment index surged 9.1 points to 53.7. Ms Heather Ridout, the Chief Executive of Ai Group said that more efforts are required to push growth of PMI. One of India's largest automobile manufacturers Tata Motors, after adopting severe cost cuts at its Jaguar unit, posted a successful second quarter report. Figures posted for the July-September period for the current year revealed a profit of 217.8 Million Rupees, a substantial rise from the loss of 9.42 Billion Rupees posted for the same period last year. The figures were officially confirmed by the Mumbai based firm today, while also sharing that sales, however, fell by 8.5% to 208.9 Billion Rupees.